A Special Thanks to all the Veterinary staff who helped give Stormy renewed hope! It all began in the early months of 2000, when a young couple came upon an ad in the newspaper for Siberian Husky pups for sale and they quickly rushed over to the "store" to purchase their bundle of joy ... and the Stormy Winter began for this boy. As a puppy, Stormy learned what was right and what was wrong by the strong corrections of his new parents. He quickly learned to mend his ways with the slap on the nose and the yell of his name. This was the only way the young couple knew how to train young Stormy. The young couple's relationship soon ended in the summer months of 2000. Stormy's dad tried to keep him safe and loved, but with the heartache of the broken relationship... he soon lost his job and his home. The young pair found themselves scrounging for food and water. They took what they could from family and friends, but their home had become the car that dad still had. Relatives would sneak the young pair into their homes for short visits, as they all lived in homes where no dogs are allowed. The stress of these situations were often taken out on Stormy, as he was the easy one to blame. Some of Stormy's visits included life with a young child. This child would throw his toys at Stormy for fun. He would also hit young Stormy with things and punch him in the nose. The young child was reprimanded by putting Stormy in a crate. The child would then torment poor Stormy through the crate by yelling and poking things at him. As Grandmother's often know what's best, Stormy's Great Grandmother had written the rescue's number down after seeing the group on a local TV show in June 2000. She had done so with the thoughts that Stormy would one day need rescue. She had watched her grandson try to balance his young life with an impressionable young pup in his care. She often tried to offer her words of wisdom that Stormy needed a stable life. It wasn't until late January of 2001, that Stormy's dad was finally convinced. On February 2nd, Stormy bid his farewell's to the life he once knew. At 14 months old, he began his journey to a brighter future with the help of rescue. In rescue, he started to learn a lesson that he never knew he would need to learn... people can be kind and people can be gentle. His foster home worked with him to teach these things through patience and understanding. With each passing day, sweet Stormy was making great strides in trusting people. 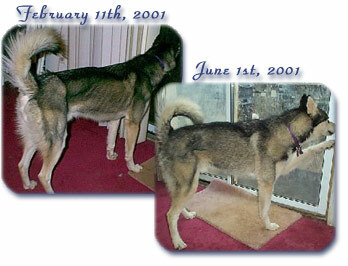 He was also on his way to becoming a healthy young man, as he was severely underweight when he first came into rescue. However, his health started to fail in later February. His foster parents noticed Stormy was having some trouble walking. The light in his eyes was beginning to fade as a crippling fever began to overtake him. Stormy was rushed to the emergency veterinary hospital. Thankfully, they were able to stabilize this sweet boy and help put him back on all four paws. His emergency visit was paid for out of the Toby Fund, which totaled $667.00. Once again the Storm had settled. And he was back on track learning that people can be nice to him and show him the love he deserves. He in turn showed his gratitude with his wonderful personality, showing us how much he loved a good belly rub. In late November, Stormy's winter had subsided forever when he met he met the Snow family. While Stormy was busy settling into his new home, a Rose was on the horizon. A young girl named Gara was turned in the Mohnton PA shelter. The reason given was "not enough time." The tides would soon change for sweet Gara, as Stormy and the Snows certainly had time for one more. 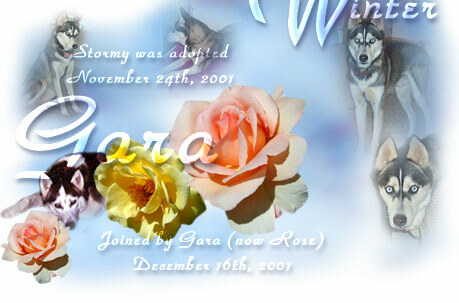 Gara came into rescue on December 5th, 2001 and she walked into her forever home and new name on December 16th, 2001. The Snow family thought she deserved a name that fit her beautiful personality and so there was Rose. The story continues as Stormy and Rose continue to adjust to their new home. The two spend their time playing and sleeping and playing some more around their house. Sometimes stopping for a quick bite to eat, then off to their play. Stormy of course enjoys prancing around with his "man" a once stuffed burglar that he adores. As Rose and Stormy gallivant about their new home, their new mom took a moment to write us this note and send us some pictures. Just a quick note to say that Stormy and Rose are very happy and settled in. They've really livened things up around here, and we just adore them! We feel so lucky to have two such wonderful dogs, and we just want to say thank you again, for the wonderful job you do. Have a happy and healthy New Year, and if you travels bring you close by, feel free to stop and say hello. I just checked out the website and was so excited to see our babies up there. That website is beautiful. I don't look at it too often, I confess, because it's just too tempting - I want to take them all. Stormy and Rose are doing just great, and getting along wonderfully, even though they have very different personalities. Stormy loves to race around the house with Rose, but then enough it enough. Rose hasn't reached the "enough" point yet. And Stormy still prefers canvas toys with floppy arms and legs, while Rose likes fuzzy or furry toys that make noise. She will determine exactly where the noise box is and then surgically remove it. After she has pulled every ounce of stuffing our, she'll carry the flat carcass around and shove it in Stormy's face until he makes a grab for it. Then she'll pull it away like Lucy does to Charlie Brown with the football. They are so funny to watch! Everyone in the neighborhood greets them by name when they go for a walk - they even have one special older lady who always has a treat or a toy for them. She calls them "the kids." We love them so much and our lives have been immeasurably brightened since they've joined our family. Thank you for bringing them into our lives and trusting us to take good care of them. Take care and keep up the wonerful work you do. If you'd like to help Stormy and other dogs who need extraordinary vet care, please click here to learn more about how you can contribute to the Toby Fund.